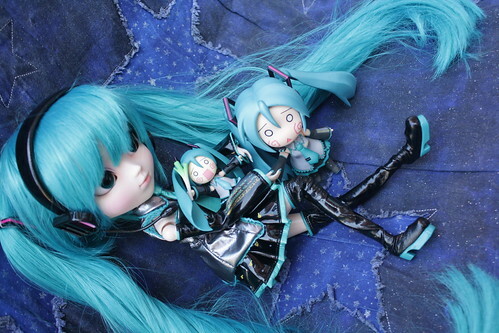 I decided to have some additional fun with my Vocaloid Miku pullip by photographing her with some of my other Miku toys (not all of them ^^;). I figure if nothing else this should give some people who are unfamiliar with pullip but love Miku an idea of scale compared to the various figures. Miku with a petite Miku nendoroid as well as a regular sized Miku nendoroid. This entry was posted in 2011- 365 Toy Project, anime figure, Anime Swag, Doll, Pullip and tagged anime figure, figma, good smile company, miku, nendoroid, petite nendoroid, Pullip, size comparison, vocaloid. Bookmark the permalink. 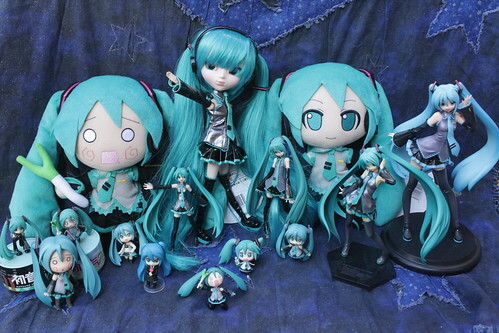 I really like that Miku to the right of the Pullip in the large group shot, which is she again? I think that is actually just a Sega Prize Miku honestly. She came on like a little keyboard but I just stood her up for the photo. love the background, make the pic that more awesome! Thanks, it’s just a blanket though needed something big for all the Miku!